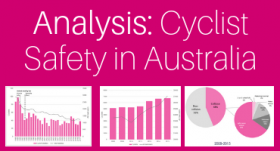 Cycling is the only mode of transport not showing an improving trend in the number of fatalities and injuries, according to an analysis of statistics from the Bureau of Infrastructure, Transport and Regional Economics (BITRE). The analysis of BITRE Australian Road Deaths Annual Summaries undertaken by the Amy Gillett Foundation, Australia’s leading authority on cycling safety, showed “High Threat to Life” injuries incurred by cyclists increased by 70% between 2008 and 2015, and numbers of cyclists counted in hospital injury statistics were 32% higher during the same period. 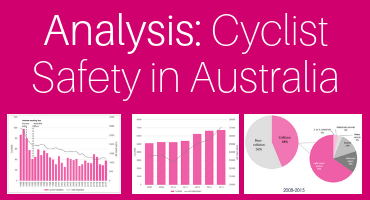 “The results of this analysis are a wake-up call for every policy-maker in Australia, and particularly in Victoria where the government has refused to implement minimum passing distance legislation,” said Foundation CEO Phoebe Dunn. Ms Dunn said minimum passing distance law was only one of a suite of measures needed to deliver safer outcomes for cyclists. The analysis found that from 2008 to 2015, “High Threat to Life Injuries” decreased 6% for car occupants and 6% for pedestrians, while increases were recorded for motorcyclists (13%), and cyclists with a staggering 70% increase. Ms Dunn said there was evidence of a positive impact on cycling safety from legislating minimum passing distances, but cyclists needed more.